Ever get the feeling the work you’re doing is not quite the right fit? So how do you ever find the work you love? 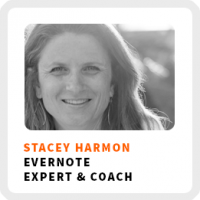 Stacey Harmon shares why you need to experiment to find your niche. Over the course of many years, she pivoted her career from working in marketing for a real estate company to selling courses on how to use the popular organization app Evernote. Stacey is one of the leading experts on Evernote. She’s built a business around helping others better organize their lives using it. Learn more about her Evernote resources and courses at Harmon Enterprises. Why Stacy views Evernote as her digital workspace and the command center of her life and business. Review some of the basic features of Evernote. How the book Rich Dad Poor Dad change Stacy’s view and my view of money. How she transitioned her career from employment to self-employment to business owner. How her community sustains her during the lows of her entrepreneurial journey. Wake up time: When her body wants to get up, unless she has an appointment. Core work activities + habits: 1) Create great content. 2) Engage in the communities her customers are in. 3) Take care of herself so she has the energy needed to focus on her business. Ideal work environment: In the first half of the day, in a variety of different workplaces. Regains focus by: Getting things out of her brain and figuring out next action steps, according to David Allen’s Getting Things Done approach, as well as time blocking. 90-day goal: Product development to address some needs customers have expressed and spreading the word about her business. 1) Get a free Evernote account, there is a free version of the app and a free desktop app. 2) Check out her Learn to Love Evernote Guide with 10 common “a-ha” moments. 3) Start to collect and centralize your thoughts in the app.